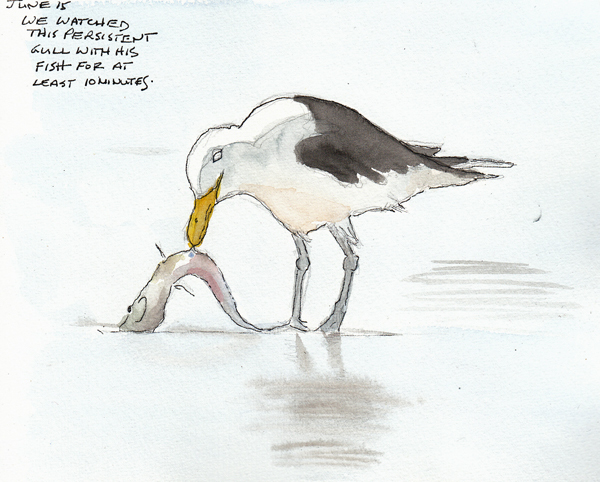 Liz Steel and Marc Taro Holmes, from the International Urban Sketchers Group proposed a challenge for everyday in June. Instead of using lines for drawing, they proposed using shapes to directly paint the art. I love drawing and think in "lines", not "shapes," so this was a perfect challenge for me. 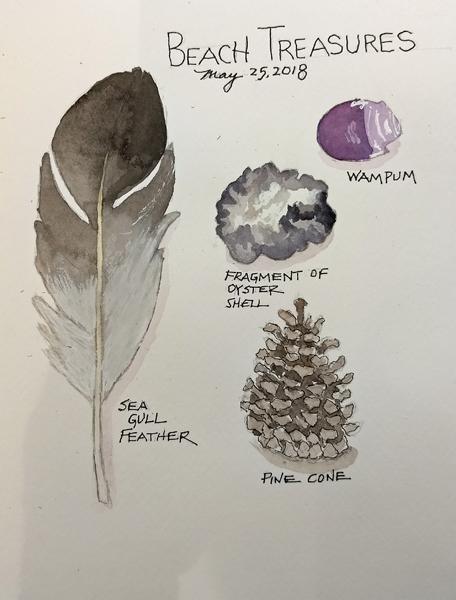 I made a Teesha Moore 16 page watercolor book with one sheet of Arches 140 lb cold press to use for challenge, and will try to paint something every day. Each page will need images from two days, and I'm starting small so I can develop some beginning skills. 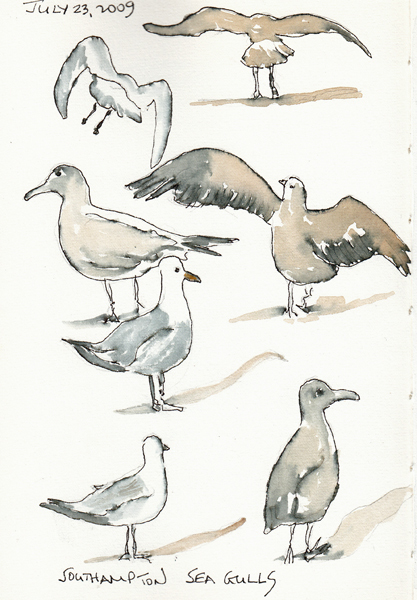 SeaGulls: from photos I took on our beach walks. 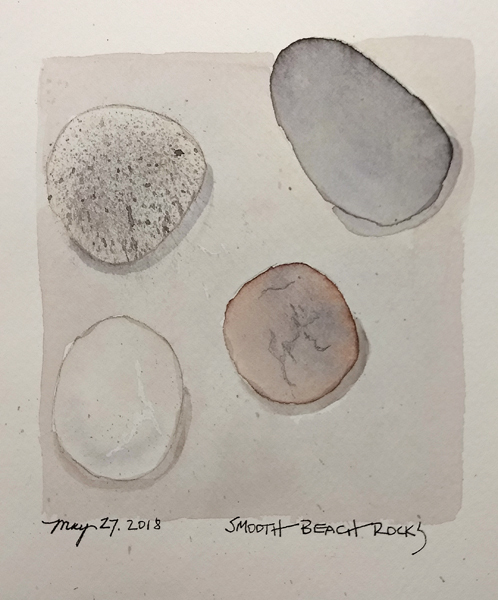 Rocks and Flip-Flops: I'm trying to learn how to paint rocks wet-in-wet and make them look smooth as they are deposited from the ocean on the sand - painted from observation. Seagulls and Lifeguards Stand: More seagulls and the life guard stand on Cooper's Beach - from my photos. I painted the lifeguard stand by painting the negative space shapes. A enormous challenge for me! 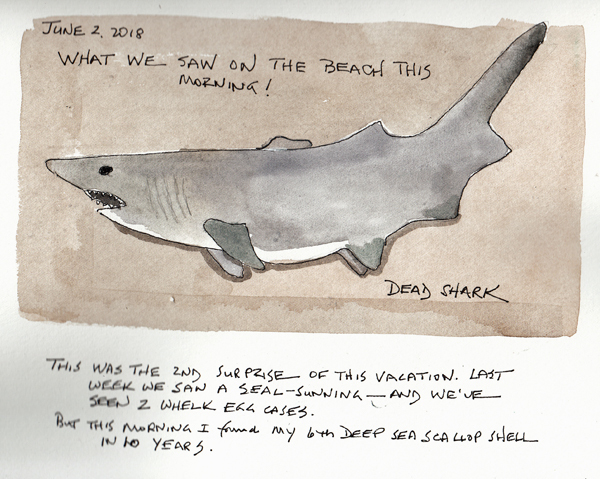 We were shocked to find a shark on the beach during our morning walk. I still need to use the shark identification algorithm to figure out what type of shark it was. The week we arrived we saw a big seal on the same beach, and we found out very quickly that it wasn't dead! But the beach had very few shells or other interesting marine life. 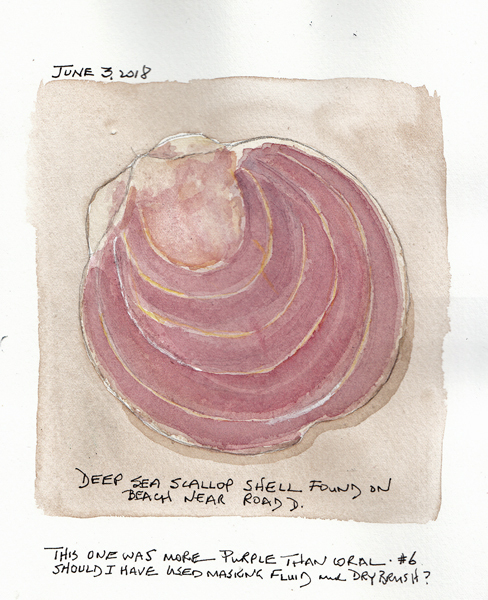 The one shell I did find was the gorgeous deep sea scallop shell - my 6th in 11 years. 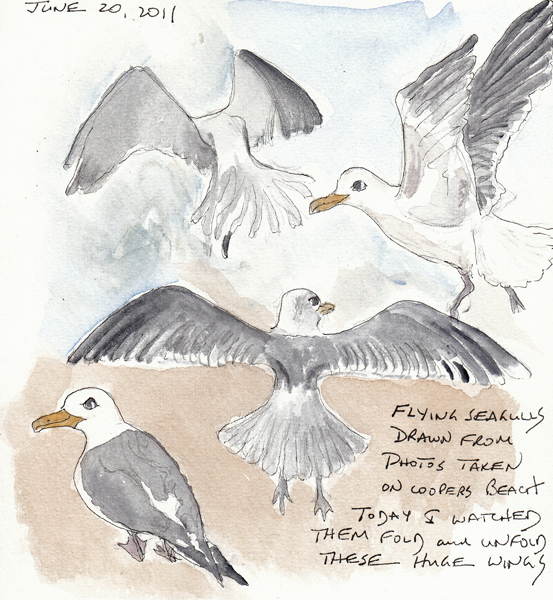 I am participating in the Urban Sketchers 30 X 30 challenge and painted this sea gull by its shapes - no lines. 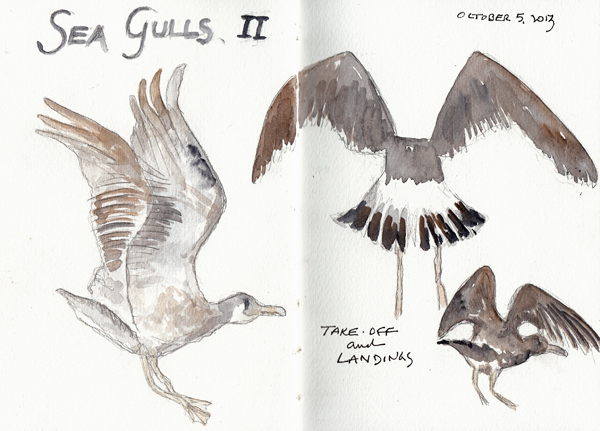 I have a separate sketchbook for those daily paintings, and I will post some as the month progresses. I think in lines, and not shapes, so this is a good learning experience for me. I'm still also doing really fast line of action figure drawings - pencil to make the line of action and pen for the drawing. 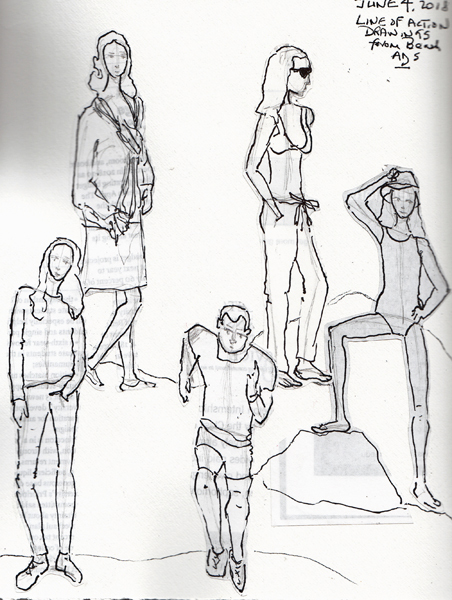 These were the beach type ads in the magazines I saw, love these quick sketches for figure drawing practice. I sketched them on scrap paper and collaged them on one of my sketchbook pages. 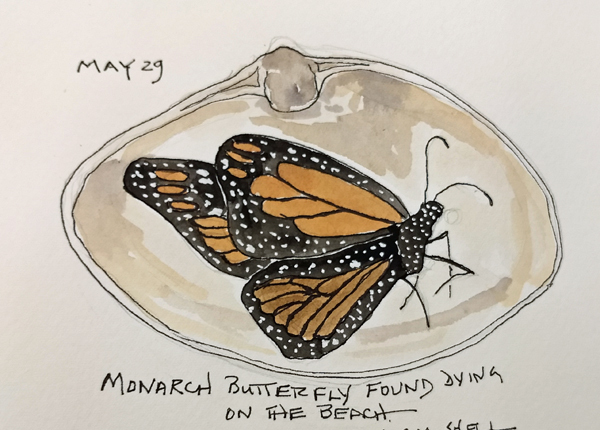 I found this dead Monarch Butterfly on the beach, and brought it home in a large clam shell to draw and paint. I've tried photographing them as they move from flower to flower, but can never get a photo that is good enough. It is gorgeous with all of the white spots in the dark black edges. 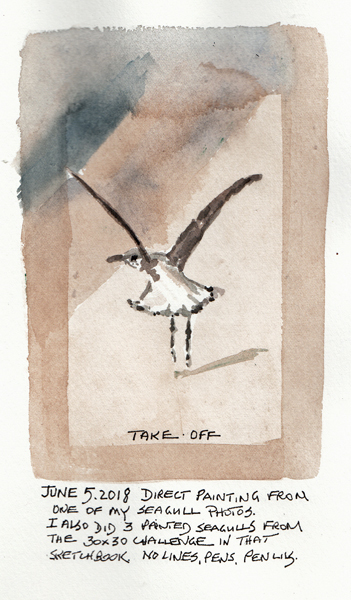 I saw something move in my peripheral vision as I was reading very early one morning in the sunroom. 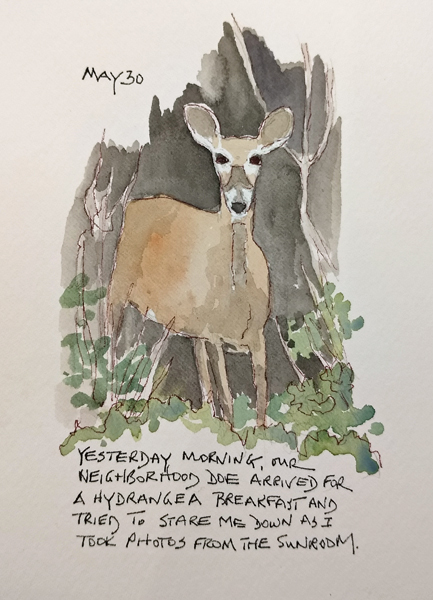 And for the second year in a row, a big doe was quietly munching the hydrangea bushes for breakfast. I slowly stood up, she noticed my movement, and stared at me, for many minutes. I was able to take many photos of her before she moved again. 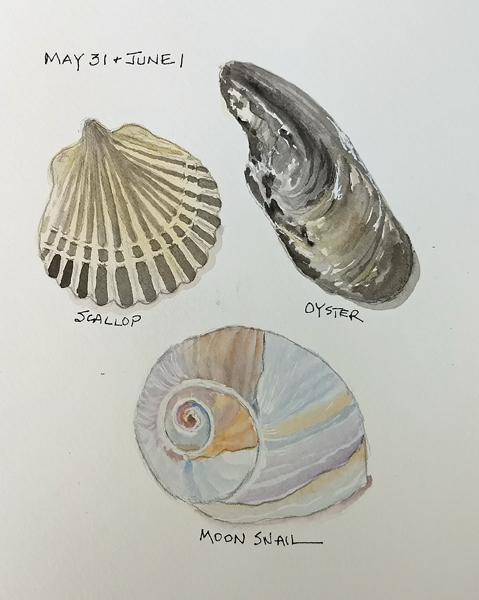 Although there a very few shells on the beach right now as we take our 2 mile early morning walks, I found these 3 shells that were worth painting: scallop, oyster, and moon snail. These sketchbook pages were photographed, not scanned, and I don't know how to remove more of the blue tinge with Photoshop. Any suggestions? We are at the beach with friends, and loving our early morning walks. In spite of the thousands of shells I've collected, I still love looking for more. But on our first 2 mile walk we saw almost none. I therefore picked up a few items to draw and paint for the day. I only learned about "wampum" several summers ago on Martha's Vineyard. It is the purple part of quahog clam shells, and beautiful jewelry is made from this parts. Wikipedia says it was used by the Northeast Indian tribes as a form of gift exchange, and the colonists adopted it as currency when trading with them. I found quite a few pieces here, but don't remember noticing these fragments in prior years on these beaches. These pages were photographed and not scanned. I was able to make the backgrounds slightly whiter in Photoshop, but definitely need more help with this. 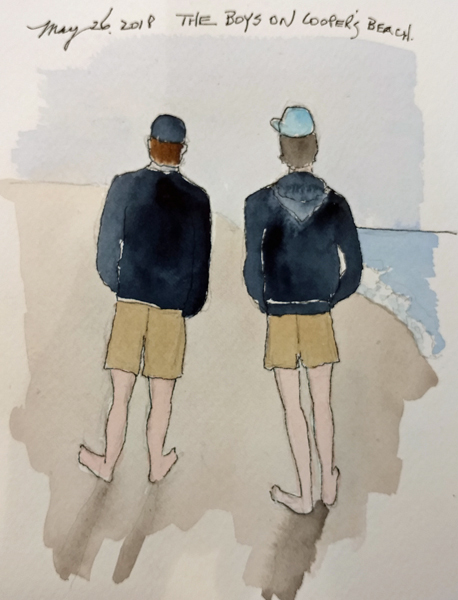 My husband and his friend walking in front of us. I love the smooth stones we see on the beach - they are buffeted by the surf and have such beautiful shapes and surfaces. I spent a considerable amount of time looking for watercolor tutorials about painting them, and finally painted them wet-in-wet.